By Chinwe Ibeh, M.D., Valeria Potigailo, M.D. A 52-year-old man presented after a fall with a questionable history of loss of consciousness. Urine toxicology was positive for cocaine. A trauma imaging work-up revealed a nondisplaced occipital fracture, bilateral frontal parenchymal hemorrhages, and possible subarachnoid hemorrhage. 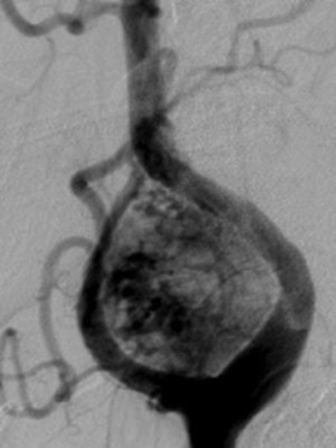 An incidental finding was identified on a computed tomography angiogram (CTA) of the neck (Figure 1). The carotid space extends from the aortic arch to the skull base and traverses the suprahyoid and infrahyoid neck to enter the anterior mediastinum. Structures normally contained within the carotid space include the carotid artery, internal jugular vein, sympathetic plexus, vagus nerve, lymph nodes, and the congenital remnants of the second branchial cleft—all of which may lead to pathology. An enhancing mass in the carotid sheath located between the carotid artery and the internal jugular vein excludes a lymph node, which is typically found lateral to these vessels rather than between them. Brachial cleft cysts are classically cystic and nonenhancing structures. An enhancing lesion, therefore, is more suggestive of a mass arising from one of the neural structures. In this case, the most likely differential considerations include paragangliomas (e.g., carotid body tumors and glomus vagale tumors), as well as vagal nerve schwannoma. Imaging distinction between paragangliomas and nerve sheath tumors is important, since biopsy of highly vascular paragangliomas is not typically recommended. Carotid body tumors (CBTs) are the most common head and neck paragangliomas. They are highly vascular lesions derived from neural crest cells located at the carotid bifurcation. They feature characteristic splaying of the internal and external carotid arteries (ICA and ECA, respectively), described as the lyre sign.1 Though CBTs are usually asymptomatic, they can present as slow-growing, pulsatile rounded neck masses anterior to the sternocleidomastoid at the angle of the mandible at the level of the hyoid bone. Involvement of the cranial nerves that travel through the carotid sheath (the glossopharyngeal, vagus, accessory, and hypoglossal nerves) can lead to associated signs and symptoms including dysphagia, hoarseness and shoulder drop.2 Catecholamine-secreting CBTs are rare but may be related to chronic hypoxia in some patients. 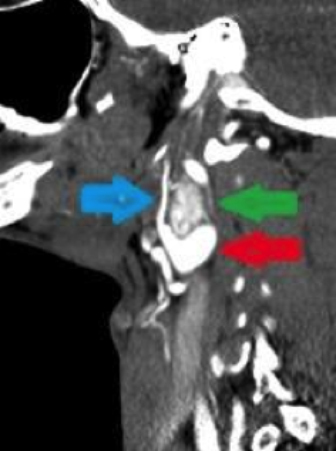 On contrast-enhanced CT, the carotid body tumor appears as an avidly enhancing hypervascular mass at the carotid bifurcation with splaying of the ECA anteriorly and ICA posteriorly. Dynamic enhancement is rapid compared to nerve sheath tumors. CTA demonstrates the relationship of the mass to the carotid arteries, while MRI is considered the best diagnostic modality for CBTs, better delineating the mass from surrounding soft tissue. MRI can detect tumors as small as 0.8 cm; tumors over 2 cm may demonstrate serpentine or punctate vascular flow voids (“pepper”) on T2 MR sequences, corresponding with vascular structures.3 The ascending pharyngeal artery is the typical arterial feeder. 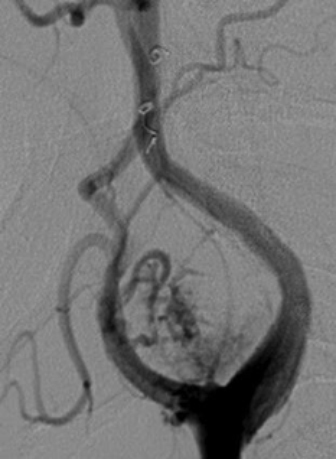 Arteriovenous shunting may be seen on angiography. Carotid body tumors (CBTs) may be associated with multiple syndromes, both familial and sporadic, including the paraganglioma syndromes, multiple endocrine neoplasia syndromes (MEN), and von Hippel-Lindau syndrome.5 Approximately 5%-10% of CBTs are bilateral, especially when in conjunction with an inherited syndrome. Imaging surveillance with MR is recommended in cases of familial disease. When presented with an enhancing carotid space mass, imaging is the primary diagnostic work-up, since biopsy of a highly vascular tumor is not recommended. 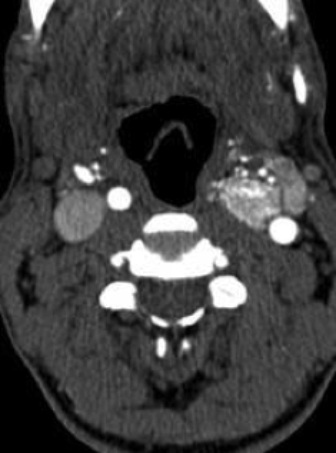 Contrast-enhanced CT readily identifies an enhancing neck mass; the pattern of vascular displacement or splaying may suggest a particular diagnosis. MRI is the modality of choice, however, in differentiating paragangliomas, which often demonstrate the characteristic “salt and pepper” appearance when large, from nerve sheath tumors. The presence or absence of neovascularity and vascular shunting is also helpful. Knowledge of these imaging characteristics is critical to render an accurate diagnosis and guide appropriate management for a patient with an enhancing carotid space mass. Power AH, Hallet, JW. Carotid body tumors. In: Stanley JC, Veith FJ, Wakefield TW, eds. Current Therapy in Vascular and Endovascular Surgery, 5th ed. Philadelphia: Elsevier; 2014:141-145. La Muraglia GM, Patel VI. Carotid Artery. In: Cronenwett JL, Johnston KW, eds. Rutherford’s Vascular Surgery, 8th ed. Philadelphia: Elsevier; 2014:1598-1614. Day TA, Bewley AF, Joe JK. Neoplasms of the Neck. In: Flint PW, Haughey BH, Lund V, et al, eds. Cummings Otolaryngology, 6th ed. Philadelphia: Elsevier; 2015:1787-1804. Arya S, Rao V, Juvekar S, Dcruz AK. Carotid body tumors: objective criteria to predict the Shamblin group on MR imaging. Am J Neuroradiol 2008;29(7):1349-1354. Wieneke JA, Smith A. Paraganglioma: carotid body tumor. Head Neck Pathol 2009;3(4):303-306. Enhancing Carotid Space Mass. J Am Osteopath Coll Radiol. Chinwe Ibeh, M.D., Valeria Potigailo, M.D.